The long distances should not discourage you. This is a big volume river, and even the lower sections with lots of flatwater flow quickly except in late summer of drought years. The standard run from Ollalie to Paradise campground usually takes less than 1.5 hour. 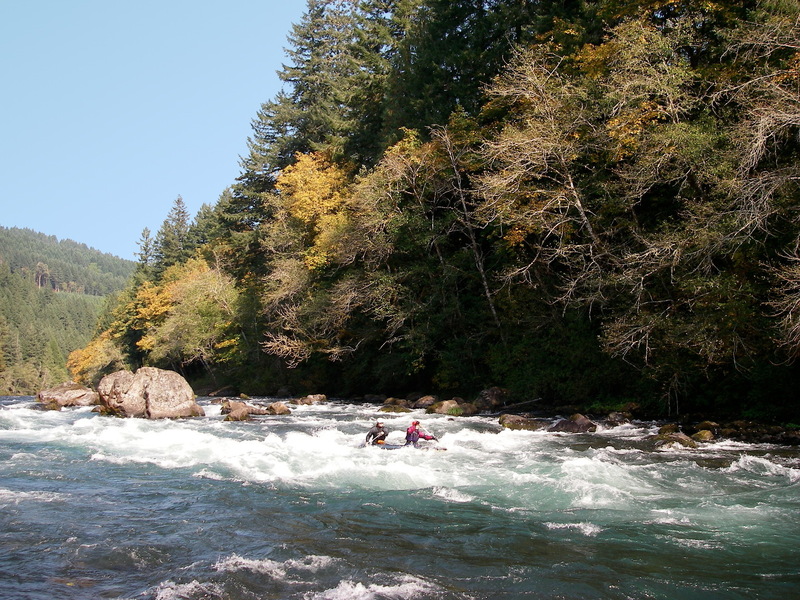 Good rapids continue below, so I recommend boating to a lower access point. 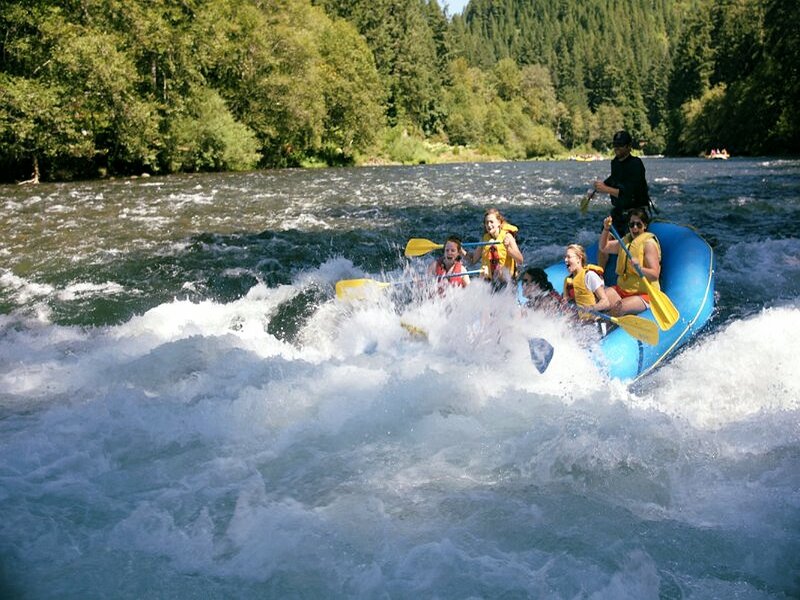 The top section is loads of fun, and good practice for coping with long rapids. Mornings can be cold at this elevation, but you can fill your day with activity by driving 8 miles uphill and hiking from Sahalie Falls to Koosah Falls, or vice versa. There is a more ambitious 4 mile round-trip hike from near Trail Bridge reservoir to amazing Blue Pool, marked Tamolitch Falls on maps. 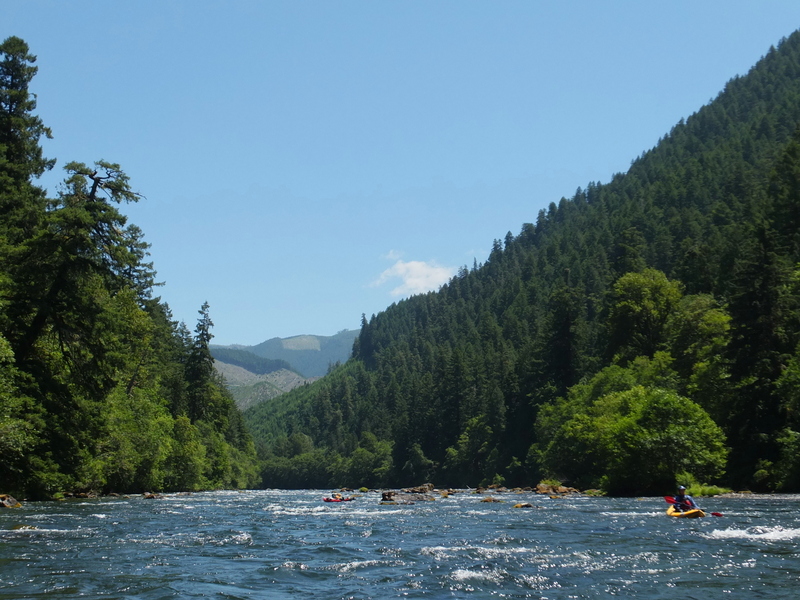 Distances given below are miles upstream from the Willamette river confluence, starting at the highest put-in, with numbers (in parentheses) for each recommended run. Photos were taken with the Vida gauge around 2000 cfs. Ollie access is .4 mile below the campground, along a one-way paved access road. You find a small boat ramp, plenty of shade, and port-a-potty (2016). 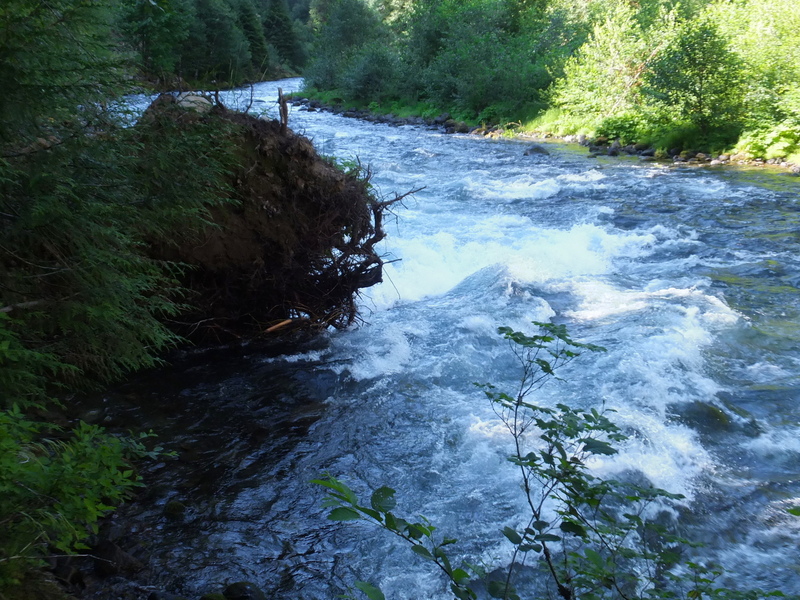 Once you start down the first rapid, action is non-stop especially at high flows. Deer Creek enters on the right, followed by the bridge for NF-2654, Deer Creek Rd. Marked on the colorful kiosk maps found at river access points. 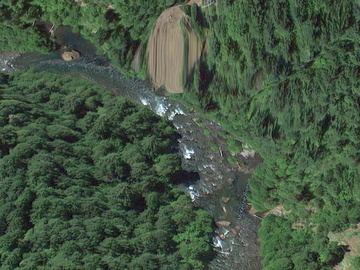 The river splits around an island, possibly holding logs, with most flow going left into big holes, unavoidable at the bottom. Shortly above this rapid powerlines cross the river from right to left, then cross again while you are busy negotiating the rapid. 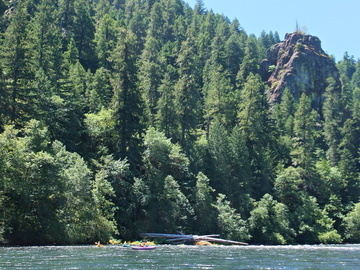 The rapid has a shallow entrance followed by large rocks and holes below. If entered left of center, the line is fairly straightforward. The Oregon guidebook Soggy Sneakers recommends scouting, but this is not a class IV rapid even at moderately high flows. Bridge for NF-2650. Shortly downstream on the left is Frissell boat launch, which allows boaters to avoid Fishladder rapid. 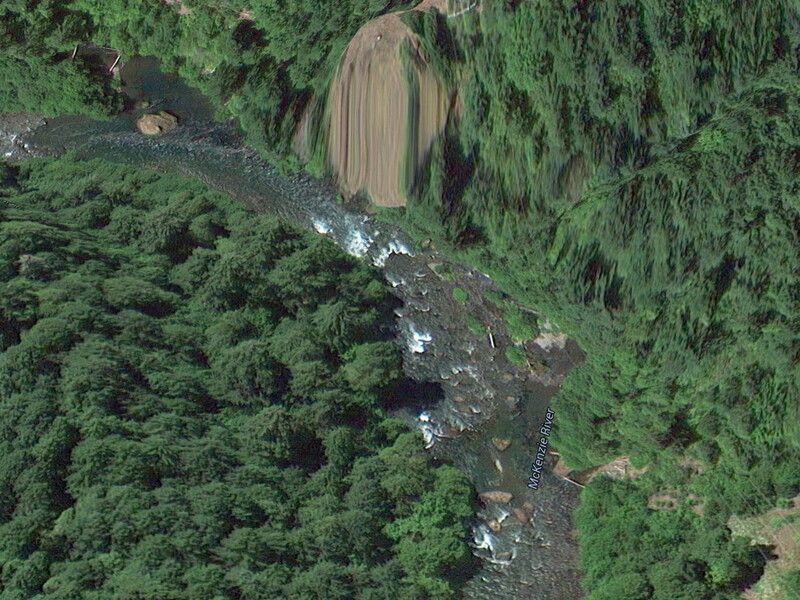 Then Boulder Creek enters on the left. Bridge at Belknap Lodge and Hot Springs. This resort is open to the public (2016) and offers a refreshing soak, for a reasonable fee, in a swimming pool fed by hot-springs. After a right curve the river flows over a boulder bar and makes a sudden left turn into big holes near the steep river-right bank. This rapid seems less difficult with better lighting in the morning. Shady Corner might be what is marked Salt Springs rapid on kiosk maps, but I feel their class II rating is low. Easily-found Lost Creek enters on the left. Bigelow Bridge with rapid underneath, marked class II on kiosk maps. The right side forms a back-flowing eddy against a cliff. Paradise campground access ramp. 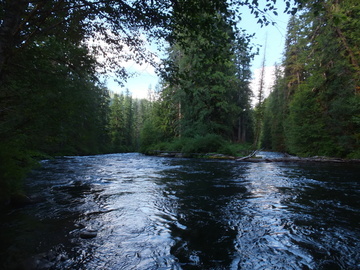 This take-out is easy to miss, being in a continuous section, and guarded by shallows on the left except at high flows. Buildings start to appear on the left. Fun rapids continue. On the right you see houses along North Bank Rd. The river splits into three channels around islands. If you take the far right channel, you can wave to people sitting on the deck outside St. Benedict Lodge Catholic church. Highway 126 bridge in the town of McKenzie Bridge. Just below the bridge is a rapid with a large rock in the middle. Horse Creek enters on the left. McKenzie Bridge access, just below McKenzie Bridge campground, accessed by the same entrance but turning right instead of left. 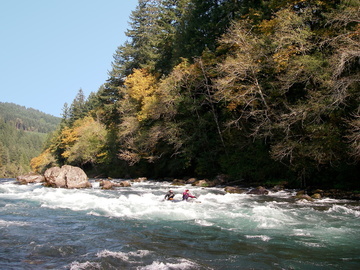 Downstream, gradient remains substantial with semi-continuous rapids. Rainbow bridge, a famous covered bridge. About .6 miles below here, the river splits around Dearborn Island, with most water going right and passing under a bridge. 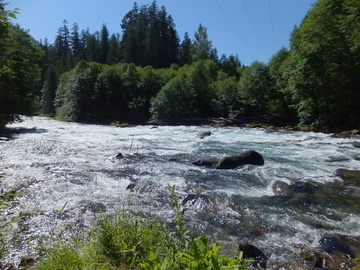 After the river closely approaches highway 126, near the end of the island, lies a rapid with strong diagonal waves on the right, marked The Vortex on kiosk maps. Cougar Dam road bridge. Bruckart boat launch is just below on the right side. South Fork McKenzie enters on left. Upstream is Cougar reservoir, and a solid class IV run above that. Redsides Rapid. Soggy Sneakers says there is a good “ender” play spot across from Redsides log scaling station, which possibly disappeared, but the play spot remains. Forest Glen boat landing on the right just after an island. After .2 mile, Blue River enters on the right. 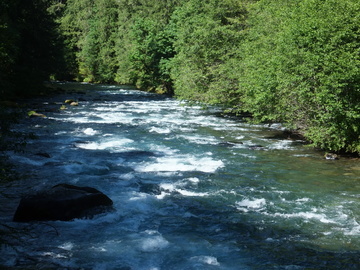 This river offers a class IV-V rainy season run above the upstream reservoir. If you go left of the island, you miss both access and confluence. Finn Rock access on the left shore, just before the bridge for Quartz Creek Rd. Parking might be tight in the afternoon. New Wave rapid, with biggest holes on the far right. About .4 mile below at a right-bank rock outcropping is Clover Point play spot, within sight of Nimrod bridge. Ennis Creek enters on the left, marking the start of class II Eagle Rock rapids. The best ride is down the left. Near the bottom at a right bend is a series of surfing waves on the left. Boat access at Silver Creek landing on the right. At river mile 49, Deer Creek enters on the left. Boat access at Rennie landing on the right. Brown's Hole, a famous thrill ride or boat flipper, on far left, easy to miss if you approach on the right. Boat access at Ben and Kay Dorris State Park. If you take out here, you miss Marten Rapids. The right side is rocky and the left side is blocked by boulders, so you pretty much have to run it down the gut. Fasten your PFD! 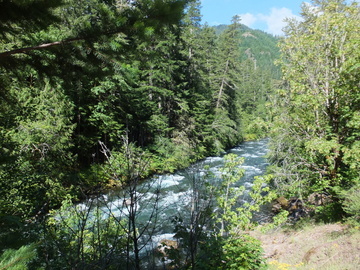 Named after Marten Creek, on the left .5 mile below. Prince Helfrich boat access. 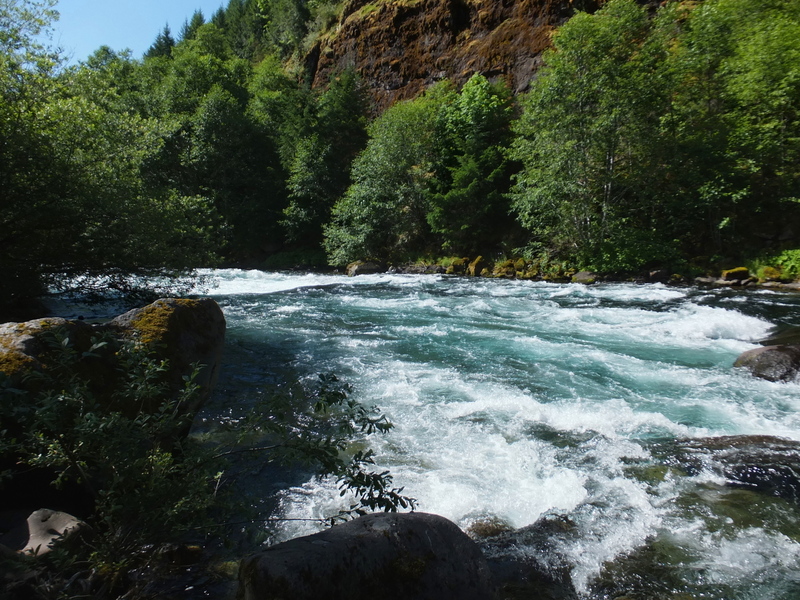 People like to take out here because it is just below the excitement of Marten rapids. However parking can be difficult on weekends and holidays. Across the river are two alternatives for kayakers: Thompson County Park and Marten Rapids County Park, both accessed by the covered bridge and Goodpasture Rd. After the river bends left at a rapid, and right again, comes class II Gate Creek rapid. The creek is downstream. Boat ramp at Goodpasture landing on river right, a good take-out to avoid the slack water of Leaburg reservoir. Ike's (Pizza) landing is is .7 mile further. If you are arriving from I-5 in the Willamette valley, take exit 194A onto highway 126 east past Springfield. McKenzie Bridge is about 50 miles upstream from I-5. If you are arriving from the east near Bend, highway 20 to 126 is the fastest route. To combine the McKenzie with the North Fork Santiam, take highway 126 north to highway 22, not 20, which goes down the South Fork Santiam. All access points are easily reached along highway 126. 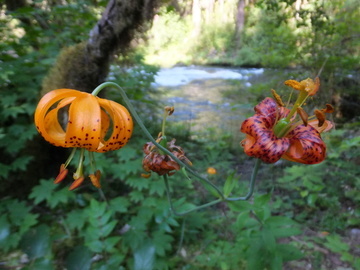 There are many USFS campgrounds near the highway.